It is so dark that I can see the Milky Way. It looks like a seine net of lights thrown out across the constellations. I am standing quite awestruck on the front deck of Moment of Zen, while behind me young boat dog and sometime navigator-trainee Sammy is following up on each plop and burp of water below us as fish feed or flee according to their lot in life. Number one dog, first officer Bindi, wiser or lazier (the two qualities are possibly related) is stretched out in the cockpit, quietly alert or asleep, I can’t tell. Off our bow lies little Tippity Witchity Island, its tree-lined shore and single dock unseen in the blackness. To the right and left are the two sparsely populated shores of the upper St. Marys River, equally unseen. We have come to the top of the St. Marys on our first night of a Potomac cruise, and as I search among the stars I am also searching for a way to describe this mightiest of Chesapeake tributaries. Not just to describe it, you understand, but to make you ache to see it for yourselves. Well, we’ll see, I finally tell myself, and shoo the dogs into the cabin for a good night’s sleep. Below in my bunk my head still buzzes with the day’s journey. It’s no secret that the Potomac is my favorite of all rivers, and from the moment I round Point Lookout—unless I am figuratively fighting for my life against one of its tantrums sparked by an ebb flow and east wind, or the opposite—I am anticipating each river and creek and arguing with myself over what to see and what to miss on this trip. On this day, we had skated down the Bay from Annapolis on a favorable current and a modest north wind, losing both the ebb and the wind only late in the afternoon off Point No Point. September’s light fades early, but we still had time to begin the trek upriver. And as we entered the Potomac on a rising flood, I took aim for the tip of St. George Island, which rose indistinctly out of the late-afternoon haze. We passed the zig-zag entrance to Smith Creek, and I remembered a dozen nights of anchoring there, sometimes cold and biting, other times hot and buggy, and a few, well, downright perfect. There were still more to try out, but they would wait. I was excited about making it all the way to the St. Marys River in one giant step. As I rounded the mile-long shoal off Kitts Point and turned Moment of Zen north, a zephyr of an offshore breeze set up, and I pulled out the jib to catch a bit of it as I passed inside. “Ah,” I said quite audibly. I was pleased with the soft heat of the day and its sigh of a breeze, the late-day light that cast the world in ochre, the prospect of drifting up the St. Marys after seven years absence, and the ghosts of the river’s long, somnambulant past. Most of those ghosts are probably busy haunting Historic St. Mary’s City, I thought as we drifted past the entrance to St. Inigoes Creek. St. Mary’s City, five miles upriver, was the first capital of Maryland, but was effectively abandoned not long after Annapolis was established as the new seat of government in 1694. After moldering under fields of tobacco, corn and wheat for nearly three centuries, the town was resurrected as an archeological site. Now several of its major buildings, including the old Jesuit chapel, have been rebuilt or restored and its more modest dwellings marked by “ghost frames”—three-dimensional timber-frame outlines that lend the landscape an eerie tinker-toy, there-but-not-there feeling. Anchoring: Sound out the area in front of the island (it’s too shallow behind for most cruising boats and power lines cross over the east channel). You’ll find 8 to 10 feet close to shore on the east side and all along in front of the island. Holding is good Potomac mud. What’s with the name? According to local lore, Tippity Witchity is a corruption of the name “Tippling and Witchery Island,” named for a house of ill-repute located there following the Civil War. Getting There: Anchor in the Horseshoe Bend or Tippity Witchity and dinghy into St. Mary’s College docks. It’s a short walk from there. Or come by land yacht with kayak and launch from the beach. There is a boat ramp off Beachville Road on Smith Creek. I rounded Church Point, with its large white cross, as the daylight seemed to linger and a group of children continued their play along its banks as the adults took a few final casts into the water from a small boat ramp nearby. Cheek by jowl with the old city on the other side of Church Point lie the un-ghostly buildings of St. Mary’s College, which, along with its academic achievements, boasts one of the best collegiate sailing teams in the country. Boaters benefit from this distinction by anchoring in the Horseshoe, a large basin at the foot of the school, and dinghying into its docks to visit the school and St. Mary’s City. I awake the next morning to coffee and the weather report, as usual. The coffee is good, but the weather news is not. Remnants of Hurricane Maria are expected to raise gale warnings on the lower Potomac and small craft warnings over the upper river the day after next. I don’t want to get caught short of my goal of Washington, D.C. before I have to turn back, so reluctantly, I scrap my plan for a day or two of poking in and out of the rivers and creeks that sprout like broccoli from the Potomac’s Maryland shore: Breton and St. Clements bays, the Wicomico River, Cobb Island and Port Tobacco River. When you come—and you will, won’t you?—be sure to go up Breton Bay to Leonardtown, where there’s a free town dock with an easy walk uphill into the historic and charming downtown. Then go up St. Clements Bay and anchor in one of its beautiful creeks like Canoe Neck or stop at one of the marinas on St. Patricks Creek. The next day, anchor off Bushwood Wharf on the Wicomico River and dinghy ashore to Quades General Store. Order a crabcake sandwich. If the late Mrs. Quade has passed down her recipe, it will be one of the best you’ve ever had. As for me, in the worst tradition of boating, I have a deadline for getting back and the specter of gale-force winds nipping at my heels. So with Sammy in the navigator’s chair and Bindi keeping an eye on things from her bunker in the forward berth, I point Moment of Zen down the St. Marys and back out onto the Potomac to see how far upriver I can get today. Waterfront estates overlook the Potomac on the route to Wades Bay. Photo by Jody Argo Schroath. Location: Roughly 58 miles upriver from Point Lookout. Getting there: There is a Charles County boat ramp right on Mallows Bay, off Wilson Landing Road. Technique: As I mentioned, not a good place to cruise around because of all the snags below the surface and because it gets quite shallow once you get inside. A kayak would be ideal for visiting this fascinating place. It’s a very popular fishing spot for small craft as well. Failing that, just stop outside for a good look. As far as I can get turns out to be Wades Bay, a large crescent scooped out the eastern shore of the Potomac just north of Maryland Point and at the northern end of the river’s great s-turn. This is also where the Potomac shrinks from an extra-large-sized river to a large-sized one. Here, I turn off the channel and begin sounding for good water. Since the wind overnight is to stay from the northeast, I look for and find a good spot, 100 feet outside the 4-foot contour close to shore and put down the anchor in 6 feet. The sun sets, the last of the day-trippers pulled up on the sandy south shore heads home, and we enjoy another sweet and peaceful night. A person could be spoiled by this. The next morning, bundled against the chill, I come on deck to find tumbleweeds of mist rolling over the warm river. They evaporate quickly in the warmth of the rising sun and are gone by the time I have the anchor back aboard and we are motoring along the shoreline. My first stop this morning is one of the river’s most unusual attractions. Just north of Wades Bay is Mallows Bay, graveyard of more than a hundred wooden steamships built—many in Baltimore—to help carry goods during World War I. But the war ended before most of them were completed, so after little to no service, most of the fleet was towed here to be set on fire, their ashes to become another ingredient in the chemically complex Potomac mud. But in a final chapter in a misbegotten history, many of them didn’t burn completely, and so their skeletons became a macabre attraction for generations of passersby. Now, however, the “ghost fleet” and Mallows Bay are in line to become a National Marine Sanctuary. It’s not the kind of place you’d want to take your cruising boat. The waters are chock-a-block with snags. But it’s a good place to explore carefully by dinghy or small boat or, best of all, kayak. There is a convenient boat ramp on the bay’s north side. I content myself with drifting as close as I dare to the largest ship’s skeleton and then slip the engines into neutral in the probably deluded hope that that would at least keep the props safe. Fortune smiles, and I spend a good hour watching the birds fly in and out—the fishing here, as you can imagine, is terrific—and examining the wrecks through the binoculars. Then I’m on my way. Beyond Mallows Bay, I pass by a lot of other things I’d meant to revisit, which I am going to tell you about so that on your trip up the Potomac you’ll remember to allow time to stop, or at least slow down and look. Because, as beautiful as the lower Potomac is with its wide-open spaces, red-clay cliffs and big rivers, it is reminiscent of a number of the Bay’s big rivers such as the lower Choptank or even the lower James. But the upper Potomac could never be mistaken for anywhere else. Take the great grey eminence of Fort Washington, for example, Washington, D.C.’s only line of defense until the Civil War. The channel here comes so close to it that you feel your next turn might be in through the front gate. Shortly afterward, the channel switches sides once again, this time to the Virginia side, and by and by you look up and spot the white eminence of George Washington’s Mount Vernon, which looks benevolently down from its bluff-top perch like some Colonial-columned Valhalla. You can pull off into the short Mount Vernon channel here and dock at the visitors’ pier (recreational craft take the right side, tour boats the left) for a visit, though not overnight. Then coming around Sheridan Point, the singularly low urban skyline of Washington suddenly comes into view, with the Washington Monument commanding center stage, bookended by Washington Cathedral on its distant hill to the south and the Capital building on the north. It’s a sight that never ceases to thrill, no matter how many times you come up the Potomac. It gives me a thrill just remembering it as I write it down. The distinctive Capital Wheel marks the approach to National Harbor. Photo by Jody Argo Schroath. Getting there: The channel into National Harbor Marina is well marked and easy to follow. The marina accepts overnight and hourly transients, and it has fuel. Kayaks and paddleboats are available for rent, though I wouldn’t recommend the latter for anything but very calm days. This is open water, and the Potomac at this point is still broader than any other river on the Bay. You could put in a trailer boat at Gravelly Point off the George Washington Parkway on the Virginia side or at Marshall Hall Boat Ramp off Bryans Road on the Maryland side. You can walk to most things and a lot of shops and restaurants. The catfish and watermelon with basil lunch at Succotash is yummy. 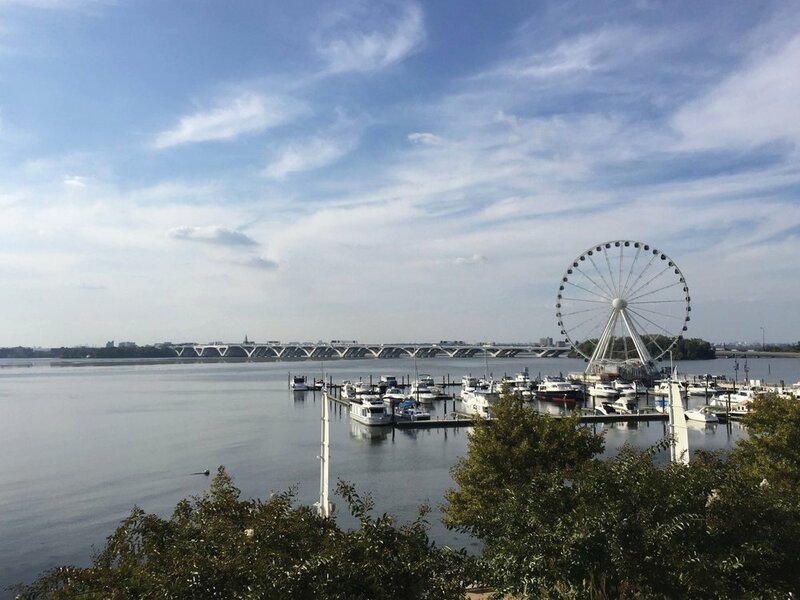 You can catch a shuttle to nearby Tanger Outlets and the MGM Casino or take a water taxi to Old Town Alexandria, the Wharf, Georgetown and Nationals Park. The National Harbor channel leaves the main Potomac channel just beyond Rosier Cliffs and skirts the shallow center of Smoots Bay before cutting over from the Gaylord dock to the marina. I stop for fuel and then bow into my slip on the dock nearest shore. The docks are floating and the finger piers about 40 feet long, so all of this is a piece of cake. Now I have National Harbor off the bow and the Capital Wheel off the stern. Wait, I’ll tell you more, but the dogs have lined up at the door, so I need to attend to that first. I snap on the leashes and we head down the dock, up the ramp and through the gate to the broad busy dock for the short walk to shore. Here we skirt the small patch of beach where a gaggle of children is clambering happily over the hands and face of the Awakening, a 700-foot-long metal sculpture of a giant emerging from the sand, arms and legs outstretched. Up the steps, we find clusters of adults happily snapping photos of each other shaking hands with a life-sized statue of Abraham Lincoln or with their arm around Frederick Douglass. At their left, George Washington doffs his tricorn and welcomes us to American Way. We walk past them and stroll in the shade of the sycamore trees that line American Way in the style of a Mediterranean boulevard. Here we pass Rosie the Riveter and Henry Ford, and there Winston Churchill and Dwight Eisenhower. We cross a street with Louis Armstrong playing the trumpet on one side, apparently for the benefit of Marilyn Monroe on the other. At Marilyn Monroe, we turn right toward the Gaylord Convention Center, where I remember there are some nice bits of grass. Later, walking back toward the water, I try to pigeon-hole the National Harbor experience. It’s not a real place, because nobody actually works here except the service people and shop-keepers. Even in a tourist destination like St. Augustine or Daytona Beach, there are people going about their everyday lives as librarians and accountants and so forth. But it’s not a theme park either. 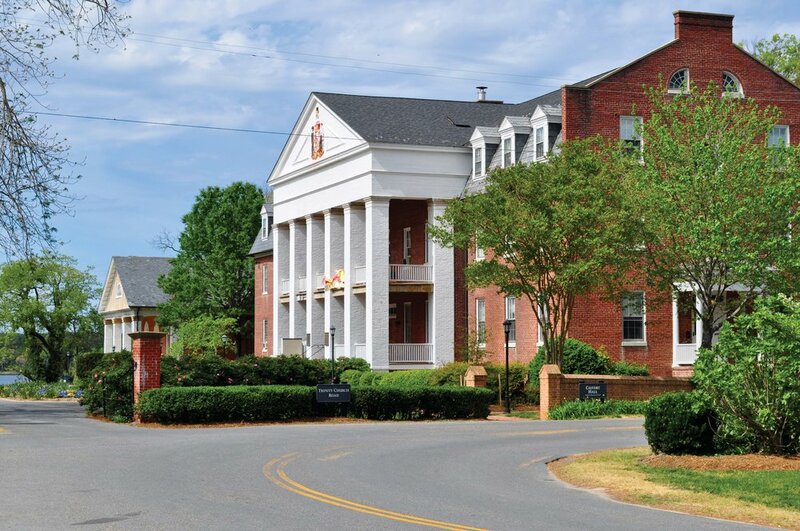 You don’t pay admission, and you can buy a condo and live here. But although you can live here, it’s not a town either. I’ve been here half a dozen times, and I still can’t figure it out. I give it up and call my friend and occasional cruising companion Kathy who lives in D.C. and talk her into meeting me after work tonight for a visit to the new casino. She arrives and we drive over in her car, since the shuttles seem to stop at 7:00 except on weekends, and a few minutes later step off the elevator into the casino. What can you say about a $1.2 billion casino and hotel? I don’t know. The casino alone contains 130,000 square feet of uber-cool over-the-top décor—Las Vegas with a few nods to Maryland and the District, like giant stylized cherry blossoms—acres of slot machines, gaming tables, shops and restaurants. We walk around and through, poking our noses in here and there, admiring the 3-foot high stack of macarons on the counter of Bellagio Patisserie and the glass walls of stilettos at SJP (Sarah Jessica Parker). All the while we are feeling a bit like two gingham-clad Dorothys on the Yellow Brick Road. So we go to eat, and immediately feel more comfortable. We know how to do this. We choose José Andrés’s restaurant and order with abandon. Shrimp and grits. New England mussels. Maryland crab cakes. Fried Virginia oysters. José’s cheddar biscuits. Atlantic Beach pie. After dinner, we venture into the gaming rooms, where Kathy studies the instructions for the slot machines and then quickly loses her allotment. We call it a night. It’s been fun, but I’m still feeling my inner Dorothy. Kathy drives back into the city, and I walk out the dock to fetch my own little Totos for their evening walk. Late that night, I stand in the stern, mesmerized by the 180-foot tall, purple-lighted Ferris wheel and its perfectly reflected twin in the dead-still water below, turning and turning silently in the night. I have checked and rechecked the weather forecast. No change. Gale warnings beginning at noon tomorrow for the Potomac from Point Lookout to Cobb Island. Small craft warnings above Cobb Island. On the face of it, a calm night before a storm is no different than a calm night before a calm day. Yet the former seems to hold suspended within its slowly vibrating molecules a world of worry and a Pandora’s box of trouble. The important thing, I tell myself, is to get a good early start tomorrow. With that, I tear myself away from the hypnotic spinning wheel and descend into the cabin and bed. Tomorrow, D.C.! Cruising Editor Jody Argo Schroath, with the help and not infrequent hindrance of ship’s dogs Bindi and Sammy, goes up and down Bay’s rivers and creeks in search of adventure and good stories.